The images associated with this post show the same fish, which was encountered guarding a nest. At the time the field crew first saw the fish, it was almost jet black, as are many of the males guarding nests on this end of Lake Ontario. Interestingly, after the crew got in the water and set up a camera to monitor the behaviour of the fish for our research, it had turned a much paler shade of brown (see 1st images). Over the next couple of hours, with the crew gone and only the camera present, the fish then returned to being almost jet black (see later images). The fish stayed in the same location throughout this time and a slightly damaged fin on the left side confirmed it was the same fish. 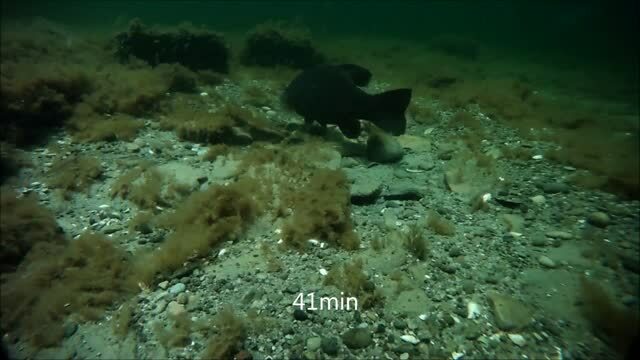 Clearly, this shows that it is not that some Smallmouth are always black, but rather that individual fish can exhibit striking colour changes at different times. As a passionate Smallmouth angler, I have also noticed this with individuals that I have caught and put in my livewell. Although a fish may be black when you first see it in the water, it is often much paler when you remove it later from your livewell. So what is happening with these fish? According to the scientific literature on this issue, these types of colour changes can actually provide important messages (often to other individuals of the same species) about the status of the fish displaying a certain colour. In fact, a recent scientific paper on this topic explains that colouration can be used to convey information about a variety of things such as social status (eg dominant fish), sexual activity, stress responses and aggressiveness vs boldness. At least for myself, this explanation seems to fit with observations made on the water. Smallmouth that are very black are relatively common on nests in the early season. Later in the year, dark individuals are still frequently observed, but these may often be dominant, or more aggressive individuals in groups of lighter coloured fish. If the fish is disturbed on the nest, or caught by an angler and placed in the livewell, the change in the “mood” of the fish probably contributes to the colour change and it turns lighter. For those interested in the mechanism, specialized cells in the skin called “chromatophores” contain the machinery that provide fish with this ability. There also seems to be a variety of ways that this mechanism can be regulated, including via hormones, the nervous system and even at the level of the cell itself in response to changing environments (ie to provide better matching with changing backgrounds).